Delicious Wedding Cakes That Made us Salivate! Cake is the undisputed winner (after gajar ka halwa) of the desert kingdom. Cakes have now become a regular affair at Indian weddings. After all, who can resist the soft sponge, the delicious chocolate or the melt-in-your mouth fondant? 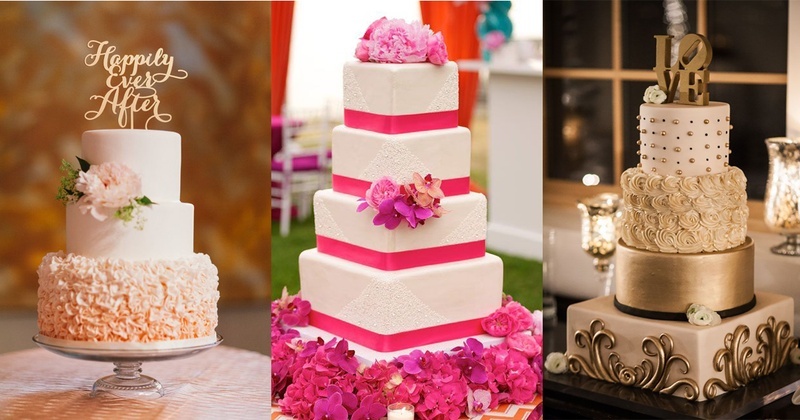 Here are 10 beautiful and mouth watering cakes we spotted at real weddings! Unique shaped cakes are becoming popular in all age groups across the country. This dhol shaped cake is full of vibrant colours and is totally eye catching! When life goes upside down, munch on some cake and when you are getting married, munch on a 5 tier upside down cake! 3. Cupcak-ing Through Our Hearts! This is one of the most unique cakes we have seen. Adding cupcakes to a lehenga shaped cake is a brilliant idea! 4. All That Glitters Is Gold! A classic combination of golden and white, this cake can hardly go unnoticed! This blue and white floral cake screams of summer, beaches and vibrant hues! Be right back, the beach is calling! This cake has two lovely doves perched on the cake. The colour combination makes it even more beautiful! This lavender coloured cake decorated with orchid is the perfect dessert for everyone! Another classic golden and white cake, this one is decorated with edible flowers and beads. The couple’s initials are bejewelled! Such a cool idea to use not one, but four colours on your cake. We love the drawings/message painted on the tiers! Is your mouth salivating? Ours is and we are going to grab some cake for ourselves!